I received a Nokia E71 mobile phone as a birthday present, and what a brilliant device it is! One thing I am able to do with it is to prepare articles for my Blog. This is relatively easy, because it has an external keypad. I find the phone is better than my Asus EEE laptop, because although both gadgets have WIFI, the E71 can also access the Internet by using the phone network - providing there is coverage. Additionally the battery life of the E71 is considerably longer than the Asus. My network provider happens to be 3UK, but I don’t think the coverage is as widespread as Vodafone; nevertheless, it is generally sufficient. Yet another advantage of the E71 is its portability, since it easily fits in my pocket. This phone is not just any old phone, because unlike most others, it has a GPS with mapping facilities and voice-guided navigation for use on the road. Being able to communicate by the spoken word, by text and by email, makes this device a very valuable piece of equipment, especially when cruising aboard my small yacht. I can also use the phone for taking photos and for making short videos. Because it was bought outright, the only additional charge is for making calls. I can text and browse the Internet entirely free, so long as I pay for a new lot of calls when my credit runs out. We have our favourite weather; some like it hot, others like it cool, and the great thing about the English weather is that’s for ever changeable. The English so much enjoy discussing the weather and Thomas Hardy was no different. Here is his poem, ‘Weathers’. Hardy transports us into the spring and then the autumn; his preference being for the period of regerneration when the chestnut tree produces its spiky fruit, young birds are on the wing and maidens blossom, while people dream of their summer holidays. He’s not so keen on the autumn that foreshadows winter where he paints a picture of browns and duns; a time likened to the gathering of rooks associated with funereal black when there’s an end to life. The great British Meteorological Office, now based at Exeter, publishes long range forecasts upon which people put their hopes. Businesses can flourish like the spring if the forecasters get it right, or they can go bust if they get it wrong. This year the forecast was for ‘a drier and warmer summer than average’, but oh, they got it so wrong (except for a few days of Wimbledon) and now predict for August a month of average rainfall. Many of us had high hopes for gorgeous sunny days when we could have done our favourite outdoor thing, whether lounging on a beach, trekking the Lake District, playing cricket or just a bit of gardening. My wife is really disappointed, and said she would have preferred that no long term forecast had been given. I’m sure many of us feel the same, but I’m reminded of the limitations of our ability to forecast the weather by these words of Jesus, “The wind blows where it wishes, and you hear the sound of it, but cannot tell where it comes from and where it goes.” (John 3:8) Even with all the sophistication available to our expert weathermen in their state-of-the-art purpose-built accommodation with one of the most powerful computers dedicated to the task, even they cannot know for certain. On the spur of the moment I went to the boat this morning. The forecast was for a south westerly wind between force 3 and 4, and low water was 11.47. There could be a faint possibility of a shower. I wasn’t sure if I would go for a sail, but I wanted to try the new Honda 2.3 outboard. Sure enough it started on the second pull and it continued running nicely at tick over. Seeing the engine was an air cooled one, I didn’t have to keep checking for a copious stream of cooling water, as was the case with my old Mercury engine. I took in several rolls on the mainsail, and under power left the mooring, then I steered to the south bank were there was a bit of a lee. There I unrolled a small portion of the foresail and stopped the engine. 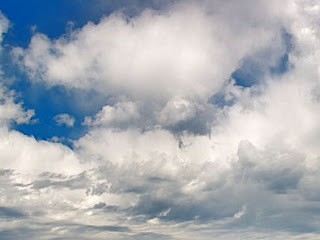 The wind was more from the South than the South West as expected, which made sailing against the last of the ebb easy. I let the Autohelm take control of the tiller and lifted the outboard out of the water. The Squib fleet and the tiny Optimists were out racing by the Crouch Yacht Club as we headed up the River to the West. To windward the ‘Celtic Warrior’, a coastal freighter, was having her cargo of wood unloaded by a spindly looking crane. A dark cloud passed overhead that sprinkled a light shower, but the sky soon lightened and it wasn’t long before the sun came out. 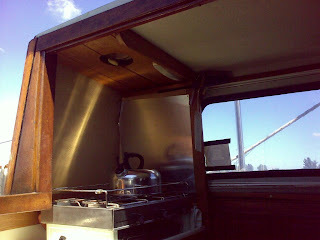 The wind eased, so I sat back and relaxed while eating my lunch as my crew friend the Autohelm willingly looked after the boat. Apart from a Drascombe Dabber with tanned sails, ‘Ladybird’ and I had the Cliff Reach stretch of the River to ourselves. There isn’t much of a red sandstone cliff there, but lined with trees it’s quite picturesque. The electric train travelling from Burnham in the direction of Fambridge rattled along the line and gave a cheerful toot. 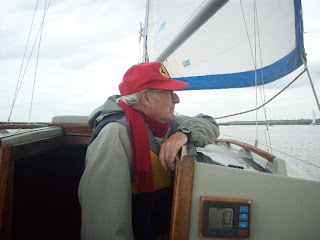 The next stretch of the River turned a little more to port which meant ‘Ladybird’ was fine on the port tack for most of the time, with the occasional starboard tack to make up to the windward side. 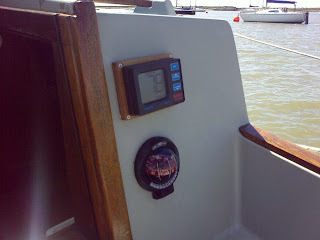 A few gusts had me taking over the steering because my faithful Autohelm could not cope. Just short of the Fambridge moorings I gybed the boat and headed Eastwards into the oncoming flood tide, but the wind was sufficient to give us good speed over the ground as we broad reached. A rather fine double ended steel Dutch yacht painted in blue made her way up river under power and two other yachts flying Dutch ensigns followed. I had seen the trio at Heybridge when walking there the Saturday before last. Back at Cliff Reach ‘Ladybird’ overtook a small cruiser towing an inflatable dinghy and ahead I could see other yachts coming my way. 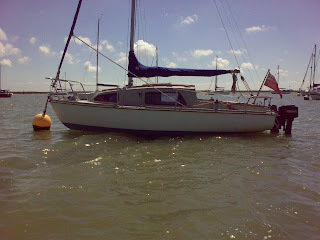 Adjacent to Wallasy Island, by Essex Marina, I let the Autohelm steer the boat as I took down the mainsail and started the outboard. 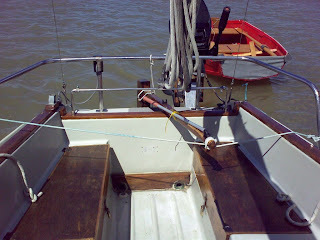 I misjudged the strength of the flood tide, but the outboard coped at low throttle. (When running in an engine of this type it is necessary to keep the revs low for about 10 hours before changing the oil to avoid undue piston wear.) 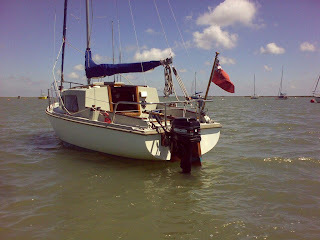 Picking up the mooring was quite easy, despite the increase of wind from the South. As soon as the boat was securely tied to the buoy, I made a welcome cup of tea before stowing odds and ends prior to rowing the dinghy to the Rice and Cole floating pontoon. Three quarters of an hour later I was at home being entertained by three of my delightful grandchildren. Oh, the joy of retirement. 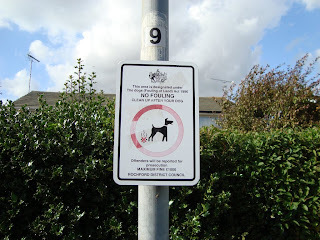 There’s a notice outside my house that reads, ‘This area is designated under the Dogs (Fouling of Land) Act 1996 NO FOULING clean up after your dog. Offenders will be reported for prosecution. Maximum Fine £1000 Rochford District Council’. Well, I must say that since the 1996 Act of Parliament making dog owners responsible for cleaning up after their dogs was applied 12 years later by my Local Council, the area where I live is a cleaner place. Rochford District Council applied the Act in August, 2008, and since then there have been far fewer dogs doing their droppings on the patch of grass outside my house. The majority of dog owners take their responsibility for complying with the law seriously. Only today, I noticed an elderly gentleman retrieve a dollop deposited by his dog on my neighbour’s front lawn. Out of curiosity, after he had left the scene, I examined the spot where the possible criminal offence could have taken place, but I could not find any evidence for supposing his dog had defecated. That’s good news for my neighbour, because it’s unpleasant when cutting a lawn to have to push the mower over a stinking deposit, or remove the stuff beforehand. Just up the road from my house there’s a children’s play park where my wife and I take our grandchildren, and I’m pleased to say that the park is an area subject to a local byelaw that bans dog from entering it. There’s a foot grating at the entrance to prevent stray dogs from gaining entrance. In nearby Southend-on-Sea there’s been a lot of debate about restrictions preventing dog owners from taking their dogs on the beaches during the summer months, and the Borough Council employ a Dog Warden who is responsible for following up cases that could lead to prosecutions, especially if dogs foul the beach. The Council can enforce a fine of up to £5000 for the offence in an area where it is not permitted and the Council’s costs for bringing the case to Court may be added to the fine. One of the problems with prosecutions is obtaining valid evidence from witnesses who are expected to provide the date and time of the incident, the location, the person’s details, the dog’s details and if a vehicle is involved, the vehicle’s registration number. Photographic or video evidence is most valuable in proving an offence. Not only must the evidence be obtained, but the witness or witnesses must be willing to attend Court. I am not a dog owner, but I can understand and sympathise with them when they are subject to the law and I am pleased with the way the majority have responded to the Dogs (Fouling of Land) Act, 1996. Three cheers to them, and thumbs up! 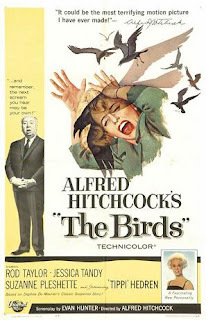 I vaguely remember seeing a film in the early sixties directed by Alfred Hitchcock called, ‘The Birds’. It was a suspense film that had you on the edge of your seat ready to dive down into the dark recess, close to your feet. The plot of the film was based on an unnatural allegiance between species of birds who joined together to attack and kill residents of a small town in the area of San Francisco Bay. I can’t remember the characters of the film, but I do recall the fear of people who cowered in seats nearby. When Hitchcock presented an introduction to the film before the actual showing, the sound of his voice and his sinister appearance set a tone of apprehension. After the first attack by a bird, more attacks occurred and the whole situation escalated into an uncontrollable scenario of ferocious attacks. From the time of seeing the film I never looked at birds in the same placid way as before, and it has taken me over 40 years to overcome this irrational persuasion. Even now, I can shiver at the thought of being attacked by birds, and I remember visiting Samson, a small uninhabited island, when I was attacked by nesting Terns intent on protecting their young. I had to fight them off with ferns I grabbed from nearby. Each time they dived for my head I had to duck and swing the ferns to fend them off. I was not sure if they would dig their beaks into my skull, but I couldn’t take that chance their aggression was only to frighten or intimidate. What has caused me to raise this subject of birds? Well, there’s been a noticeable increase in the numbers of certain birds where I live, and I put that down to the mild winters and balmy summers of recent years which have helped them breed, often with more than one clutch of young. Birds have always interested me, and of late I have been intrigued with their antics. 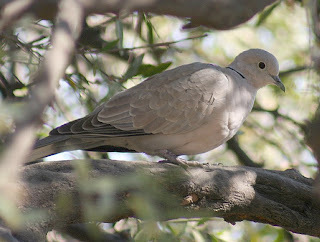 Collared Doves have a particular repetitive flight during their mating season that is characterised by flying upwards to a point where they appear to stall before gliding down. More often than not two birds keep company, a male and a female, but at certain times they gather in flocks. Today I observed a pair attacking a Magpie, and their aggressive action reminded me of the Hitchcock thriller - Hence this contribution to my Blog. 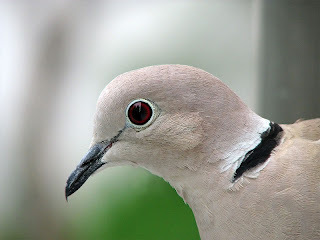 I actually like Collared Doves because they are cuddly, the sort of bird you want to hold and to stroke. They have tiny, smooth feathers that merge near the nape of the neck where there is a distinctive black half-collar marking. I’m attracted to their subtle buff, grey colouring and their white tipped tail feathers. If you can get close enough you can see their beautiful eyes with iris rings of reddish brown. Collared Doves migrated to the UK from the European mainland in the mid-fifties and have increased their numbers ever since. Wherever there are cereal crops and seed-bearing plants, caterpillars and aphids, there you will find them. They also enjoy feeding from bird tables and bird feeders. They can be identified by their persistent, repetitive call of ‘coocoo, coo’. Oh, and watch out for their droppings, a whole collage of them are by my doorstep, below the TV aerial they have adopted as their perch! Let me first say that I do not believe in jinxes, i.e., things that bring bad luck. In fact, I do not believe in bad luck. I simply accept that circumstances can be related, and that happenings can coincide, or events can follow one another. Luck is defined as ‘chance’ - that’s failure or success in particular situations. Some people believe they are lucky, and others believe they are unlucky, but I don’t subscribe to such beliefs. Those who know me well will understand that I believe in the sovereignty of the God of Heaven, and it is He who ultimately rules in all things, large or small. But, let me tell you the story of a mobile phone. Like King David who was attracted to Bathsheba, I was attracted to a Nokia 9300i and I had to get it, no matter the consequences. David suffered as a result of his lust for Bathsheba who was married, and he lusted to the extent he had her husband killed on the battlefront, so that he could take her for himself. My lust did not go as far as killing to achieve my desire; I simply paid for the phone through Ebay. It arrived and my troubles began when I tried to synchronize it with my laptop. After a long battle I managed to get the phone to occasionally respond to my computer. A few of you will know that I spent a while cruising a small boat to the Scilly Isles last summer, but you may not know that I fell into the water from the yacht when the Nokia was in my back pocket! Having saved myself by clambering aboard, I realized the urgency for drying out the phone. I took the thing apart and allowed it to dry in the sun, but I couldn’t get it to work. Later, after returning from the cruise, I tried the phone again, and to my surprise it fired into action, but 5 of the keys and the front display did not function. Thrifty, as I am, I put the phone up for auction on Ebay with a full explanation of the malfunctioning parts, and I was astonished when the winning bid was £80. My elation was short-lived, because 5 minutes after the good news, I received an email from Ebay to say the bid had been cancelled, because the person who made it, was disreputable by previously using Ebay to defraud customers. I was informed that I could offer the phone to the next highest bidder, but he did not take up the opportunity, which meant I lost the fees for the initial auction. Deflated, I just forgot the whole affair, until a fortnight ago when I successfully auctioned an outboard motor, which inspired me to try the Nokia again. I made sure that all the details regarding the phone’s faults were clearly set out in the description, and I limited the bidding to UK residents, but I was amazed when the first bidder from Indonesia said he would send me £30 to cover the postage. I let him know that he would have to find a UK address for me and that I would not be posting the phone to Indonesia - To this he agreed. During the course of a week I followed the bidding which eventually rose to £28.50, but who should be the successful bidder? An Italian! He took ages to pay for it, and I had correspondence with him agreeing I would ship the item providing he sent me the cost of postage, so he let me have £5.00. I tested the phone before packing it, and to my chagrin I discovered the battery would not take a charge, although it had worked only a few days before. I thereupon ordered a replacement battery to be delivered in time to go with the phone today, but it did not arrive, possibly because of a Postal strike. The fellow in Italy requested that I should send the parcel with a tracking code and have him sign for it on arrival. Enquiries at the Post Office revealed that a tracking facility was not an option for Italy, but signed delivery was, at further cost. Well, I posted the parcel and I’m wondering if pain or sorrows will follow. Some of you will undoubtedly think the phone is jinxed, but for me the whole sequence of events were pre-ordained by a loving, caring God who tests those He loves. For me, luck and jinxes don’t come into the equation, but I’ll be mightily pleased if I never see or hear of the phone again! I feel sure this won’t be the end of the story, because I’ll be sending the replacement battery to the Italian, and if he is not satisfied, I’ll re-reimburse his money and tell him as lovingly as I can, that he can keep the phone. At this time of year the North Atlantic Jet Stream is like a writhing, wriggling Serpent that spans the Atlantic from Nova Scotia to the UK; in fact it continues revolving around the earth between the latitudes of 30 to 60 degrees north of the Equator, sporadically declining in vigour. In the summer it tends to flow along a path nearer 60 degrees north, and in the winter reverts towards 30 degrees north. This fast-flowing, high altitude blast of air travels eastwards as the world revolves westwards, but sometimes this restless Serpent loses his energy and fizzles out altogether before being born again. Winds at the centre of the Jet Stream, a band of moving air 2 to 3 miles wide, about 4 to 7 miles above the earth, can reach speeds in excess of 100 mph and has been recorded at 400 mph while passing over Scotland. You can imagine how such a powerful force can influence the weather below and either side of it. Here can be found the reason for the strong winds and many showers, coupled with thunderheads that have plagued our so-called summer this year. This energetic Serpent has persisted in weaving an average course over Central England; hence he has wreaked havoc by bringing deluges of rain that have caused flooding and misery to those affected. Farmers are none too pleased, but some have delighted in the fact that they have not had to water their crops. Sailors of small boats such as the type* I own have found the winds have been too strong for comfortable sailing. As I don’t believe in a Wind God, I can only appeal to the One Real God, the God of the Bible, to placate 'Jet Stream', the writhing Serpent. Metcheck.com map of the current Atlantic Jet Stream. 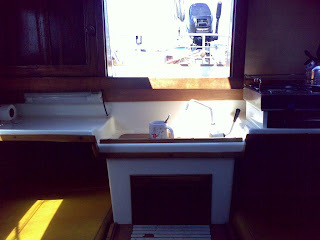 I’ve mentioned my little yacht several times, and yet I have not displayed any photos of her on my Blog. To put matters right I’ve uploaded several here. I’ve also included three photographs of the crew. Unexpected pleasures are the best, and today I found this to be so. 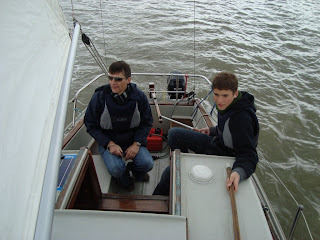 I had hoped to sail my boat with my nephew and his son, but the wind was gusting to 32 mph - that was according to the Burnham-on-Crouch weather station - and I didn’t fancy taking the ebb towards the eastern end of the Maplin Sands where there would be no shelter. We had wanted to see the seals that laze on the sandbanks at low water, but commonsense prevailed. 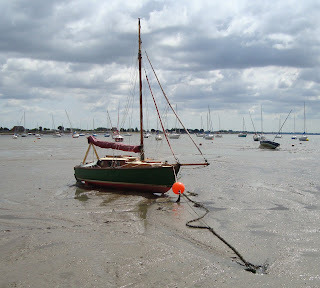 Instead of sailing, I took the car to the Yacht Basin at Heybridge from where I walked along the old canal towpath. The last time I had seen the canal was two years ago and I noted that new shingle had been laid for pedestrians and cyclists. There was also a new outdoor refreshment area by the free car park. Food and drink can be purchased there from the proprietor who has a hut and a floating pontoon for rowing boats for hire. I observed that as usual Moorhens and Mallards swam between yachts and motorboats moored beside the reedy banks. Further along the canal, seated by the water’s edge in spaces between marsh grass and bushes, there were a few fishermen with their very long carbon fibre rods and submerged landing nets. Shafts of sunlight emerging from gaps between white clouds reflected off rippled water to highlight golden water lilies and tiny stones lapped by the clear water which nearly overflowed the towpath. Apart from the soothing sound of the pulsing wind through the branches of overhanging trees and dense hedgerows there was a wonderful quietness that made the sharp calls of moorhens sound harsh by contrast with the inner peace if felt. I savoured the clean moist air as the west wind cooled my cheeks while I strode along the path. A couple of cyclists swished by and I met a man and women with their white husky dog. Back at the Basin where the canal enters the River Blackwater, I took photos of a gorgeous wooden ketch named ‘Black Rose’, and while conversing with her shipwright owner I discovered she had been made from Siberian larch overlaid with veneers of another wood, the name of which I can’t recall. Continuing my walk, I took the path to the Blackwater Sailing Club where I chanced upon ‘Shoal Waters’, Charles Stock’s tiny yacht he has cruised locally over many years. Charles is a well-known sailor on account of his book. (http://shoal-waters.moonfruit.com/) On my way back to the Basin I briefly sat at a wooden seat strategically placed where there’s a view overlooking moored yachts. Attached to the seat there’s a bronze plaque dedicated to the memory of Bru Nichols who had been a commodore of the Blackwater Sailing Club. The short epitaph engraved into the plaque informs the reader that Bru was a man who had a great sense of humour and a zest for life. I wondered what words my nearest and dearest would choose to sum up my character and life. After crossing the narrow bridge over the lock gates I walked a little more to a sheltered spot below the river wall from where I had a view over the mud flats; there a single Redshank searched for its lunch, while further on, Black – headed Gulls noisily vied with one another, and overhead a flock of chattering Tree Sparrows zoomed by. I ate my picnic lunch as the wind-blown clouds scudded overhead and I knew my decision not to sail had been right. How concerned should we be about contracting Swine Flu, and if we are concerned, what precautions should we take to minimise the chances of being infected? Apparently, most people who become infected by the virus recover without any adverse effect, and those most likely to fall victim are boys and girls between the ages of 5 and 14 years. The elderly and the young, along with those who have chronic health problems are more likely to find difficulty in recovering from the illness, and those same people are the ones who will possibly die because of the Swine Flu pandemic that has spread to over 100 countries. How can we avoid contracting the disease? There are no sure answers to this question, but short of stockpiling food and drink and cutting oneself off from all human contact, avoiding the virus that spreads this flu will be very difficult. The Government organisations involved in prevention and cure are working flat out to provide Tammy Flu and an effective vaccine, but the latter will not be available until August, and then there will only be sufficient for ‘key workers’ – those who administer essential services, such as doctors and nurses who will become, and have already become frontline workers. Those who work on transport services, communication services, suppliers of electricity, gas, and of course those who provide drinking water; they and other ‘essential’ workers will have priority of immunisation. In time, the Government feels confident that enough vaccine will be produced to protect all those who will not have contracted Swine Flu. Meanwhile there is sufficient Tamiflu obtainable by prescription from local GPs that can be taken at the onset of flu-like symptoms to mitigate the effects if one has Swine Flu. Swine Flu can become a very personal issue when it directly affects someone dear to you. In my case I would be anxious if any of my immediately family came down with the virus, and I’m not alone with these fears. There must be thousands, if not millions in the UK who are worried about the insidious invader who neither respects age nor gender, nor is the bug only selective of those already suffering with ill health; indeed, the parasite, for that’s what it is, will bring down those weakest in the community, those with the least resistance. We can do something about not spreading the deadly disease by keeping ourselves in quarantine at home if we suspect we may have the symptoms. If we think we may have Swine Flu we can be vigilant so as not to infect anyone with whom we may come into contact - firstly, by not having physical contact with them, and secondly by using disposable handkerchiefs when coughing or sneezing. These throwaway handkerchiefs should be placed in a bin immediately after use to avoid contamination. Washing our hands frequently will minimize the chances of passing on the virus by means of contact with inanimate objects such as door handles, cash machine dispensers and shared computer keyboards that people may touch. At the time of writing this article (16th July, 2009), there have been 26 deaths from Swine Flu in the UK. 40,000 people a week are reporting the symptoms to their GPs. This epidemic has become a pandemic, which means there’s little chance of us not being directly affected by it. 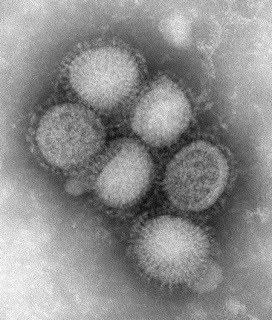 Even if we do not contract the flu itself, family members, friends and acquaintances will become victims - not necessarily victims to the extent of losing their life, but some will experience anxiety and fear, and others will suffer the physical effects incumbent with Swine Flu. This is all rather gloomy, but on the bright side it may not be as bad as predicted by the pundits, a bit like the weather forecasts of late, that have put me off sailing my boat. For the coming weekend the forecast is for rain and strong winds, as a low pressure system squeezes northwards along the east coast of England between two high pressure areas. Only time can tell, as with the Swine Flu pandemic. In this technological age there is a temptation to get hold of the latest electronic gadget and since the early eighties when Sir Clive Sinclair launched the ZX80 home computer the proliferation of such gizmos has mushroomed. Bill Gates was quick to cash in on the computer market with software, and from there on, the competition has increased, resulting in numerous computerised items, and in more recent years the emphasis has been on miniaturization, especially with the aid of nanotechnology. One only needs to look at the mobile phone market to see thousands of phones available for purchase. The Apple iPhone when it was introduced two or three years ago was the most desirable gadget for yuppies. More recently there’s been a rush to buy micro- laptop computers that are small enough to fit into a lady’s handbag, and yet the technology is such that the lady can browse the Internet from any location where there is a dedicated mobile phone service. Needless to say, I was not immune to the ‘must have’ gadget syndrome, but most of the time I lagged behind getting such gadgets when they were first introduced because of their high price due to demand and a need for manufacturers to recoup their costs. Two or three years after first hitting the market, articles that were ‘must haves’ can be obtained for a fraction of their original price, and by then any of their flaws have been rectified; hence my delay in acquiring such products. Having the time just now for a clearout of accumulated electronic bits and pieces I have decided to auction them on Ebay, but I am amazed how little they are worth, because when I first obtained them I had to pay considerably more. Nevertheless, if I can add to the cash in my wallet I shall be satisfied, but the interest in my auction items is minimal, as far as I can tell by the counter that monitors the number of watchers who may be interested in bidding. Still, recycling my unwanted gadgets by extending ownership of them, rather than throwing them in a dustbin is more satisfying. Maybe when they come to the end of their useful life, they will be disposed of for final recycling into various materials for the process to continue, i.e., the manufacture of electronic gadgets for profit and for the satisfaction of those who must have the latest techno-gadget. Tanned and elated, my neighbour who had been on a fishing holiday in Spain, showed me photos of a blue marlin he and his son had caught. One photo in particular made me gasp, because it showed the magnificent creature at the weigh in; this was an exceptional, shimmering blue specimen - enormous, the likes of which many fishermen would give an arm and a leg to catch. 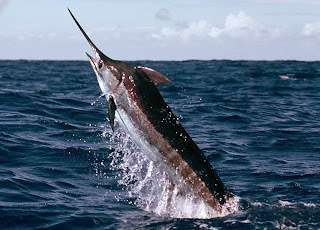 I was reminded of Ernest Hemmingway’s, ‘The Old Man and the Sea’ that tells the story of Santiago, an experienced old fisherman, who battles to bring home a blue marlin he caught way out in the Gulf. After killing the fish and fighting off sharks that devoured his prize he finally managed to make it back to land with nothing but the marlin’s skeleton - he himself had almost been overcome with exhaustion. Both of the aforementioned blue marlins took the bait - my neighbour’s in reality, and Santiago’s in the realm of fiction. I too, like those marlins have been lured by bait, but unlike them, to date, I haven’t been taken in, because I’ve fortunately spotted the difference between the real thing and a fake. As I sat at my computer downloading emails I became aware that someone was ‘phishing’, because there dangling before my eyes was a tempting morsel that wasn’t quite right. My eyes focussed on the words, ‘Security Check from PayPal’ and immediately, warning bells rang. A closer inspection confirmed that the email in the form of a web page was a fake with several links, any one of which, had it been opened, could have compromised my computer by invading it with ‘worms’, or a particular link could have filched personal details of my bank account, pin numbers etc..
‘Phishing’ is a fraudster’s method of obtaining information with the purpose of stealing money from a person’s bank account via the Internet. Scammers have tried their ‘phishing’ lures on me before and I have become very aware of their cunning deceit and persistence. Apparently one in twenty users of the Internet is taken for a ride, and yet these immoral cowards who steal from them, continue to hide behind the cover of anonymity out there in Cyberspace, constantly improving their sophisticated techniques. Few of these criminals are brought to justice; therefore, be aware, be alert and be free like the blue marlin who is not taken in by fakes and lives another day! I am selling an outboard engine with an auxiliary fuel tank and I would prefer the tank to be empty before it is collected by the new owner, but you wouldn’t believe how difficult it has been for me to find a place where I can get rid of the petrol legally and safely. One of the problems is that this particular petrol contains a small quantity of 2-cycle oil which is necessary when running a 2-stroke engine. Any number of people would be very happy to be given petrol, but this is not the case when it has been mixed with oil. At first I thought I would take the 50:1 petrol/oil mix to my local Council Dump, but after enquiring at their base I was told they only accept oil, not petrol, and they could not advise me were to dispose of the volatile liquid. I made further enquiries with my local Council Environmental Department and they suggested I take the petrol to a garage, preferably to a large garage owned by a well known company such as Esso or Shell. Again, I found that none of my local garages would accept the petrol for disposal. Further enquiries at the Council Office led to me asking at the Civic Amenity Helpline and they said PHF Waste, a private firm who undertakes waste disposal on behalf of the Council, may be able to collect the petrol from me. A spokesperson at PHF Waste said she would find out if the Council would pay for the service; if not, I would have to pay. She also said she would let me know the outcome, but to date I have not had a reply. The Citizen’s Advice Bureau couldn’t come up with any suggestions, other than that I should contact my local Council. My enquiries didn’t end there. I thought to go online and make searches. The Automobile Association offered a service for removing fuel from vehicles that had been incorrectly filled with petrol when they should have been filled with diesel and vice versa. I was astonished at how much was charged for this service for a non-member - £250.00, and for a member, £184.00. The Government Environment Agency had absolutely nothing to offer. 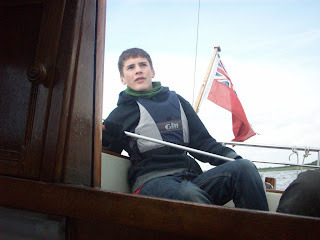 Then I thought to contact the Royal Yachting Association who took note of my problem and said they would get back to me the next day when their Green Blue representative would be available. He phoned me the following morning and suggested I should contact a local vehicle breaker’s yard. This I did, and I was astonished to find there was one within easy walking distance, of which I was unaware, because it was tucked away so discretely, hidden by trees at the end of nearby lane. The owner said he would take the petrol and dispose of it. On reflection, I think there must be a fair number of people who would like to safely dispose of small quantities of petrol because they no longer use petrol lawnmowers or chainsaws, or like me, just want to get rid of it for reasons best known to themselves. I am of the opinion that Local Councils should provide a free or low-cost facility for the disposal of small quantities of petrol or diesel. Petrol is a dangerous, toxic and explosive liquid; therefore the temptation for easy disposal by pouring it down a drain should be minimized by the provision of community service points, say at vehicle breaker’s yards. The supporting costs to local councils would be minimal. Provision of such service points might eliminate the dangerous practice of dumping highlighted by The Automobile Association who claims that thousands of litres of unwanted vehicle fuel are poured into England’s drains! Zopher while conversing with Job thought he was wise when he spoke these words, “For you have said, ‘My doctrine is pure, And I am clean in your eyes.’ But oh, that God would speak, And open His lips against you, That He would show you the secrets of wisdom!” (Job 11:4 – 6) Well, one day the deep secrets of all will be revealed ‘when God will judge the secrets of men by Jesus Christ,’ (Romans 2:16) and yet, we all continue to have secrets. Why is it that we are secretive? Do we have hidden thoughts, the remembrances of deeds we would rather have not done or the fear of revealing something because of personal hurt? There are so many reasons why we should want to keep secrets. Maybe we would not want to embarrass someone or make a person feel obliged to recompense us because of an oversight on their part? Who am I going to please today? If I’m not miles out at sea in my boat by myself there’s every chance I’ll be near or with people. Unless I completely ignore them and avoid getting in their way I’m most likely to engage them in conversation or become involved with their wants or needs. My wife, for a starter, cannot be avoided when I am living in the same house, neither would I want to avoid her because we have been buddies for a long time and we know how to please each other. In fact, our aim is to please, not that we always do, because we are not perfect and sometimes because of our imperfectness we let the other down. The truth is that pleasing another person is not really difficult; a smile is a first step, and because smiling is infectious there’s often a reward. So both parties benefit. “Good morning. How are you? 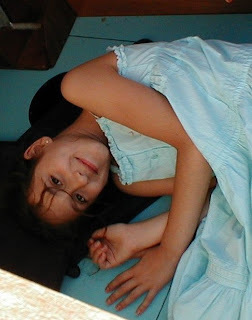 Did you sleep well?” is a good introduction to a pleasing day. Our granddaughter from Italy is staying with us for a week or so, and this morning I challenged her as to who she would be pleasing today. After a short pause she said with enthusiasm that she would be pleasing her Nanny. “Why would you want to please her?” I teased further. She was so right. When she returned home she showed me a new pair of soft shoes and a rather special pair of jeans that had been made to look well worn by having designer shreds and patches incorporated into them. She had a smile from one ear to the other. She was well pleased. What had she done to please her Nanny? Well, she had enticed her to McDonald’s for a snack which gave both of them pleasure. She showed me two plastic mugs given with her meal and she took delight in sipping cool drinks from them. She loves McDonald’s because she always comes away with some trophy and I have a number of them she has given me for my delight; a plastic King Kong that lights up when pressed is one such article, and an articulating warrior dressed in armour who waves his sword is another. How could I please her before her bedtime? The opportunity soon arose when she asked if I would play tennis on the back lawn. What a delight it was too! We had been watching a scintillating match on TV between Murray and Ruddock at Wimbledon and thought we would try too. I was Murray and she was Ruddock, and of course I lost, just as the English usually do and the Scots sometimes. I knew I couldn’t win, because of my age handicap and a biased referee. It was no good appealing to the line judge, because there was no Hawkeye, the electronic machine that follows the ball’s passage through the air and shows exactly where it lands.